For Lily, life is a full contact sport. 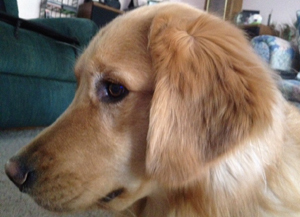 Every morning she wakes up with a new enthusiasm for the day, tail wagging, wrestling with Molly and a big smile. When we visit my parents, she gets so excited like she hasn’t seen them in years. She is always looking for the next thing so we ask a lot “Where’s Lily?” If she’s gone for more than a minute, she’ll be into something. She has an insatiable curiosity. 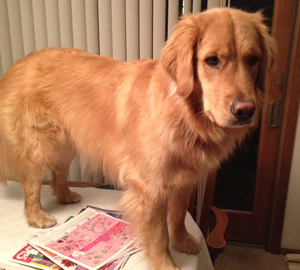 I came out of the kitchen at my parents this morning to Lily standing on the table and then moving to the chair – just for a new view on the world. A few weeks ago, my Mom was in the back yard and found the salt shaker. Every few weeks, I find a sock or two in the back yard. When I come home from work, one of my slippers is always in the living room where Lily and Molly lay by the window keeping an eye on the neighborhood. These funny moments keeps life interesting and remind me to be as curious as Lily. To look for the next thing that can fill each day with moments of simple joy. Lily is lovely! 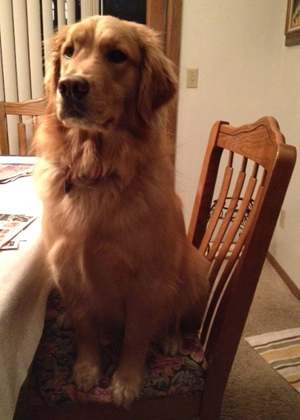 It’s so funny, how she sits on the table and chairs! I can’t imagine life without Emmy, and it’s only been four weeks since we brought her home! We are head-over-heels for our little four-legged baby. Lily is beautiful! And obviously quite a character too!